Home > Thoughts > Bikers Rule ????? 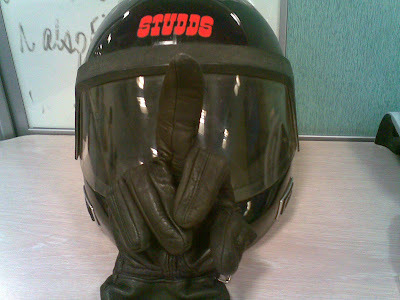 Do bikers rule the Indian road? Guess it's a very vague question in many perspectives. Specially if we consider the perspectives of safety, convinience of travelling in any weather condition, comfort and added luxuries. Bikers have always been blamed for rash riding, over speeding, causing reckless mishaps and I do accept that such blames are not always without any grounds, but I believe that the argument goes both ways. 90% of time a car hits a bike, it's the biker who suffers the most, 90% of the time, a biker tries to make a sudden stop either in order to avoid a collision or in order to save someone, it's the biker and bike who suffer. So, if the bikers are at the recieving end most of the time, they do diserve their share of respect and honor. The world might be getting more and more towards super cars but at the end of it, it has to be bike which proves to be ultimate style statement, be it films or the real life. The wind flowing through your hair, the sense of the engine working underneath, the raw movement infront of the eyes makes you fell as if you are a free horse always destined to take the world for the offering. It's upon us to take this pleasure and enjoy it and not becoming insane just because with the slight twist of our wrist we can do something unimaginable, something which would make our adrenaline explode in a frezy, because India is still not the country which would forgive a slight mistake of a biker. So, why not be a free mustang and not a tamed horse. A good rider is not,who does not make any mistake but he also save himself from other's mistake weather its a four wheeler, two wheeler or a pedestrian..
Madam to bilkul hi thik kehti hai. Bhai zara sambhal ke !!! I never mentioned about the speeding of bike because I also understand the responsibility of safe riding and have also mentioned about it. but still then........the real skill is in riding the monster and not being dragged by it. I am using super splendor .i feel better. this bike all parts good .and parts quality is best . this day automobile all parts price is precious . and parts demand is in rising day by day.